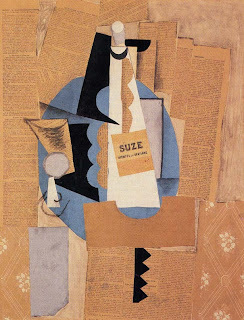 A representation of the public sphere imagined by Pablo Picasso in his collage Glass and Bottle of Suze (1912). This entry is little late as the unit has almost been completed. So my comments here are based partly on past notes. This particular unit, 'Media Technologies and Public Sphere' deals with themes such as how media technologies play a central role in shaping the idea of 'public communication'. It deals with role of newspapers, publications, oil paint, the camera, television, the telegraph, the World Wide Wide, the Internet and radio and there role in shaping public discourse. What is media's significance in liberal-democratic societies? How did the public sphere shape the development of liberal democracies in the west? The public sphere although may be shaped my mediums discourse like the media technologies mentioned above, there are other 'mediums' that may not be too apparent: the coffee shop from the seventeenth century onwards that emerged sometime between the Commonwealth and the Restoration; the Salon in 18th Century, the pre-Revolutionary France, that emerged in Paris in opposition to court life in Versailles and the café of the nineteenth and twentieth, full of rootless cosmopolitans (that is I think how Stalin described them), revolutionaries and café intellectuals. The last "medium of discourse" is represented above in a collage by Picasso.